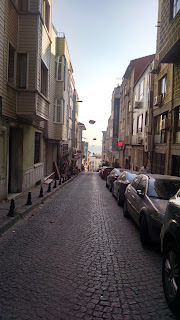 For our first full day in Istanbul, we stayed mainly in the Sultan Ahmet area. 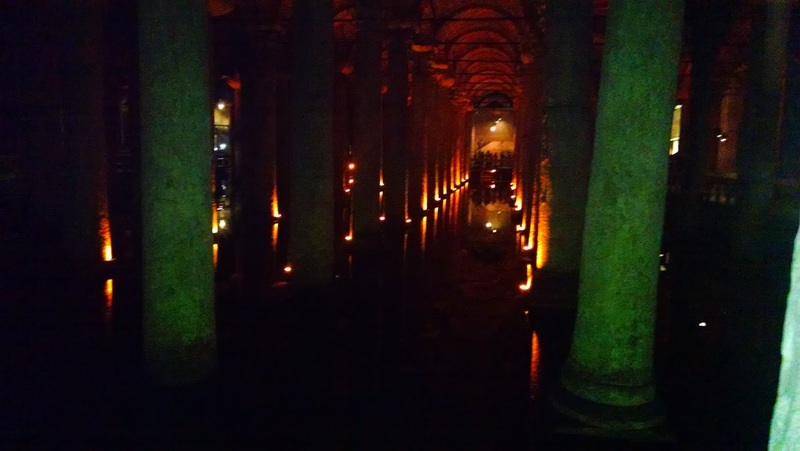 This included the Blue Mosque, Hagia Sofia, the Basilica Cistern, and the Grand Bazaar. We gave the Topkapi Palace a miss because the girls were getting tired, but after seeing a scale model of Topkapi at Miniaturk, we'll probably visit it the next time we are transiting through Istanbul. We saw a long line wrapping around, walked into courtyard. On our stroll through the courtyard, we were met by a guy offering express service to the front line if we'd go to his carpet shop after visiting the mosque. Okay, sounds legit, right? He walked us right up to front where the cordons started and gestured for us to get into the line there (the line to get in wrapped around three sides of the mosque). I overheard folks behind us saying "They must be special." Interestingly, the abaya with hood that Kacey wears in Saudi Arabia wasn't up the mosque's standards for a head scarf, which was kind of ridiculous considering the degree to which the Saudi Religious Police will go to ensure conformity. Inside the Blue Mosque, the most overwhelming thing is how many lights there are hanging from ceiling, which pretty much blocks the view of everything else. Not really impressed, honestly. 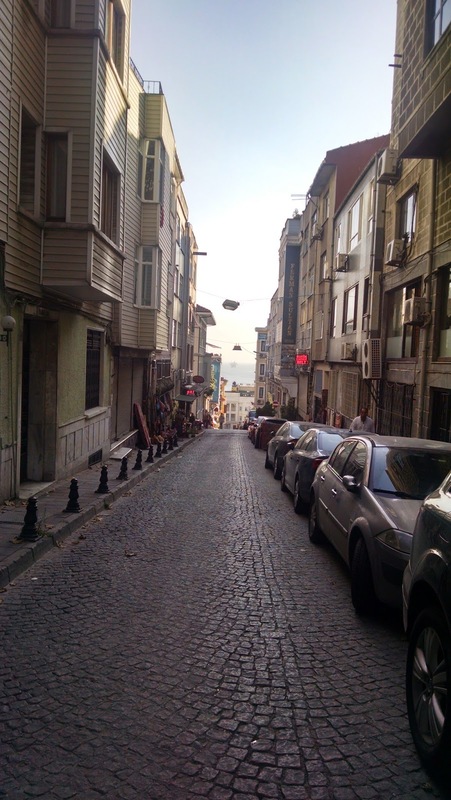 It was a short walked to carpet store from the Blue Mosque. Our older daughter helped us pick through the roughly two dozen that were laid out for us in the showroom, of which we bought two. During our viewing, we were served Turkish delights and apple tea. When our younger daughter broke a glass, the store owners said it was good luck! The carpet store our delivered our carpets directly to our hotel (Sokullu Pasa) in a bag small enough for carry-on so that we didn't have to lug it around for the rest of the day. I highly recommend this store and the experience if you are in the area. After leaving the carpet store, we got lunch at the nearby Sultan Pub before going into Hagia Sofia. Now this place is impressive. What was most impressive about the entrance was the amount of wear that the stone steps had received over the ages. I also liked the detailed stonework on the walls, and for that matter all the details. After the Hagia Sofia, we skipped across the street to the Basilica Cistern. I was thinking that it was just going to be a large well, but no. 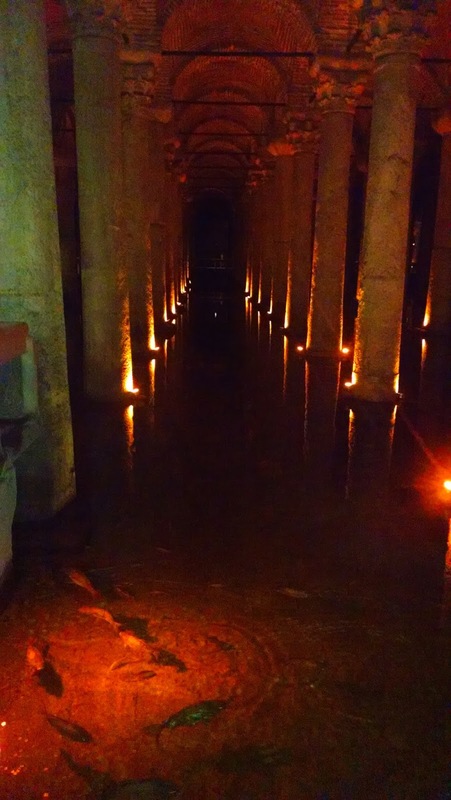 It's basically an underground lake with columns and arches rising out of it. I was surprised by how many fish there were in it, but I guess it keeps down the algae. There are also special sculptures here, with the Head of Medusa (L) and the Crying Column (R). After we went into the cavernous underground cistern, we resurfaced and went into the cavernous Grand Bazaar. 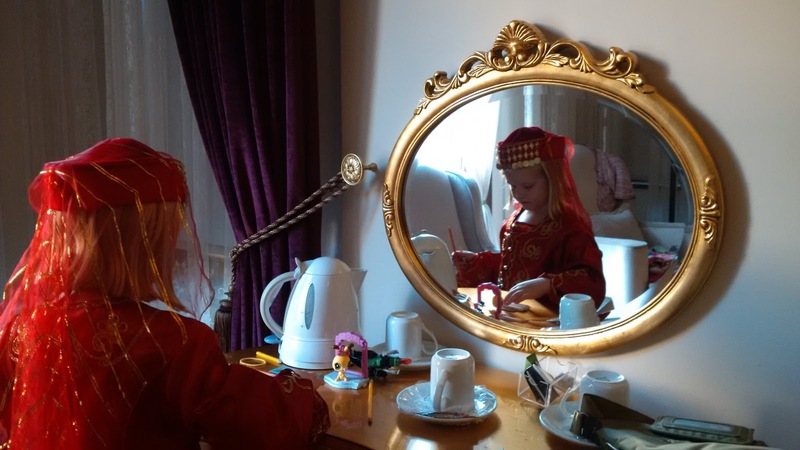 Since this was also somewhat of a birthday trip, our older daughter got to try on several dress-up outfits (with shoes!) before settling on the one she wanted. When can we get back to shopping? We walked back to the hotel from the Bazaar, and our younger daughter had toured so hard today that she stayed asleep in the Ergobaby carrier even after I took it off. We had dinner nearby on the terrace of Fatima Sultan just at sunset, and watched clouds change from white to pink to purple to dark blue. As for food, I had the mixed grille, Kacey had the mixed fish platter...both were very good. The place doesn't get great reviews for the food, but come on...you're paying for the view. As always, I recommend ordering what the locals typically eat and know how to cook, and not ordering what is served to appeal to tourists (because it will rarely be as good as back home).